"Uber requires all driver-applicants submit to a background check. So how did [suspect Jonathan] Hemming get approved? How long had he been driving for? And what was his star rating? Today we emailed Uber with those questions but got no response." WJLA's report noted that police found weapons, ammunition and drug paraphernalia in Hemming's Uber vehicle, in which he was arrested. Highlighting Uber's role was important because "so much focus has been on their background checks," said WJLA's Lewis. Lewis broke the story on Twitter a little before 1 p.m. on May 25, and later that day WJLA aired his report during the 4 p.m. and 6 p.m. newscasts. The Washington Post covered Hemming's arrest as well. But the Post's article, also published May 25, doesn't mention Uber. "The Post wrote a story about the arrest, WJLA then reported that the suspect was an Uber driver (it was not mentioned by law enforcement)," Post local editor Mike Semel wrote in an email response. "Despite repeated calls to Uber, police, and prosecutors, we weren't able to immediately confirm that Mr. Hemming was an Uber driver." In its May 26 print edition the Post continued to omit the word "Uber," and the paper has yet to publish a follow-up story despite the now-established connection between Hemming and Uber. This isn't the only time Uber has faired better in the Post than in other media. "We cover Uber as we would any other company," Post executive editor Marty Baron wrote in an email response to submitted questions. "Jeff Bezos has never had any influence over our coverage." But what Post owner Jeff Bezos does have is a financial stake in Uber. Since the ride-hailing giant is privately owned, the size of Bezos' investment in the company isn't public. "I have no information about the value," Baron wrote. Bezos, who owns the online retail giant Amazon, has an estimated net worth of $63 billion. In 2013 he purchased the Post for $250 million. "Our general policy is to name individual investors when they control or manage a company, when they are active rather than passive investors, when their individual participation in a company is the subject of dispute, or when something about the nature of their participation generates news. In the case of Uber, Jeff Bezos does not appear to be any of those things. Even so, we have frequently identified him as an investor in the company." "If they're going to disclose it sometimes, why not all the time?" asked media critic Adam Johnson. "Either it matters or it doesn't." Johnson has written about the Post's conflicted coverage of Uber for Fairness and Accuracy in Reporting, a media watchdog group. For Johnson, Bezos' Uber investment is newsworthy because of its potential size, as he explained in an email. "Back of the napkin math has Bezos owning over $1.5 billion in stock (probably much more soon after they get valued again). That, by definition, gives him influence in the company as any major shareholder would. 'Passive investor' is a meaningless distinction." Uber is now valued at $62.5 billion, more than Ford or General Motors. The company's rapid growth has been fueled by large investors, the most recent being the most controversial. Earlier this month Saudi Arabia announced its Public Investment Fund was investing $3.5 billion in Uber and filling a seat on the company's board. "Uber is profiting from this ban, generating tremendous revenue by providing male drivers to Saudi women who are not allowed to drive," stated a petition from the activist group Codepink. If Uber profits from Saudi Arabia's ban on female drivers then presumably so do its shareholders, including Bezos. Yet the Post's coverage of Saudi Arabia's investment fails to disclose Bezos' stake in Uber. Also left out of the Post's coverage of the Saudi-Uber partnership are the protests of Saudi women, which have been reported on by other media outlets. "They're investing in our pain, in our suffering," Dr. Hatoon al-Fassi, a professor and women's rights advocate, told Bloomberg. The protests have grown on Twitter, where a popular hashtag (translated from Arabic) is: 'Saudi women announce Uber boycott.' "Saudi women are like cash cows for transport companies," read a tweet cited in a BBC report. "The prevention of women from driving is no more a social matter, but it is now an economic benefit of the government. To God we complain," another user tweeted. But what most distinguishes the Post's coverage may not be its failure to cover the Saudi women's protests, or the lack of disclosure of Bezos' stake in Uber. Rather it's the Post's explanations for Uber's involvement in Saudi Arabia. "For many women in the country, the app and its competitors offer a chance at greater autonomy... If you are a Saudi woman and you want to commute to work or run errands on your own, a ride-sharing app can become an important tool." While nuanced overall, the Post's story offers explanations for the Uber-Saudi partnership which are seldom found in other media reports. "Uber has acknowledged the role its app plays in the country, usually portraying it as a strength. In December the company offered free Uber rides to Saudi women during the first election in which they were legally allowed to vote." "I would take strong issue with your suggestion that the piece was overly favorable to Uber," Post foreign editor Douglas Jehl wrote in an email response. "You have cited two paragraphs from the story, but you have otherwise overlooked the thrust of the piece that took a critical view of this alliance." On the night of February 20, Uber driver Jason Brian Dalton killed six people and injured two others in Kalamazoo, Michigan, police said. Before, during and after the alleged shootings, Dalton picked up fares in his Uber vehicle, according to media reports. More than an hour before the killings began, a frightened passenger jumped out of Dalton's car. The passenger, Matt Mellen, later spoke with the local CBS affiliate WWMT. "I'm upset because I tried contacting Uber after I had talked to the police, saying that we needed to get this guy off the road." After Mellen's interview, several media outlets followed up with stories highlighting Uber's lack of responsiveness. "Passenger says he warned Uber of erratic driver before Kalamazoo killings began," blared an L.A. Times headline. "Uber acknowledged getting complaints about Kalamazoo shooting suspect," read an ABC7-NY headline. 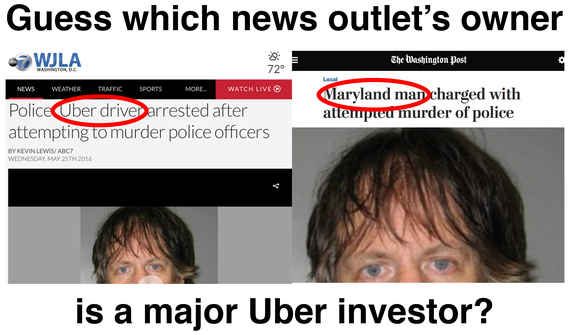 The Post's coverage of the shooting, meanwhile, didn't emphasize Uber's inaction to the same extent. "Uber's algorithms could spot crimes in progress. But do we want them to?" read a Post headline. The story (a guest post) discusses the tradeoffs between safety and civil liberties in today's data-rich environment. "Uber screening process drew scrutiny long before Kalamazoo shootings," was the headline of one of several Post stories on Uber's screening. "It was unclear how a background check would have helped," the story noted, since "the suspect in Saturday's shooting did not have a criminal record." "Ultimately, investigators may decide that there was no reliable way to predict that Dalton would, during a single shift on the job, morph from his identity as a driver into his role as a mass killer," the Post reported. Like a number of other Post stories, this one quoted Mellen, but his criticism of Uber's lack of responsiveness wasn't the focus. The Post most forcefully takes Uber to task over its lack of responsiveness in another story, in the final paragraph. "[Mellen and his fiancé] said they struggled to figure out how to warn Uber about the dangerous driver. They said they eventually found an e-mail address and sent a lengthy message, but only received a reply from Uber on Sunday around noon, almost a full day after reaching out." In the Post's reporting on the Kalamazoo killings, which is extensive, the newspaper once again failed to disclose Bezos' stake in Uber. Public Citizen, the public interest group founded by Ralph Nader, recently released a report examining Uber's operation in eight U.S. cities. While each city's experience is unique, Uber's willingness to bully, lobby, and where necessary flaunt local laws, is consistent throughout. "No single company or interest should have the power to use its wealth the way Uber does, overwhelming democracy's deliberative and decision-making processes," Public Citizen president Robert Weissman said in a press release accompanying the report. Uber's astounding growth has coincided not only with accusations of bullying, but also the mistreatment of workers. At any given time, Uber is facing multiple lawsuits on several fronts, including over whether its workers are employees or, as it contends, independent contractors. As Uber continues growing, its stockholders, including Bezos, presumably benefit. And when Bezos' newspaper reports on Uber, a company he's heavily invested in, that is the definition of a conflict of interest.